The fishing season in several states across the Midwest will be opening soon. In areas where seasons are open year ‘round, anglers are already out there chasing walleyes, northern pike, bass, and panfish. The next few weeks and months are the most popular times for an angler to get on the water in search of fishing action. If those anglers keep the next few ideas in mind, they will be more successful in that search. Fish of any species that I know of have two priorities in life: They spawn and they eat. The spawn for some species is over by now, in full swing for other species, and a couple of weeks away for other species. For those that have completed the spawning ritual, the next few months will be a time for eating. All they’ll be doing is looking for their next meal. The predator fish will be near baitfish or crawdads or bugs or whatever they eat in the body of water being fished. Fish where the food is and you’ll be fishing near the predator fish. Next thing to keep in mind: Don’t get locked into one particular technique. There are lots of ways to catch fish. You can use live bait or artificial bait. You can cast, troll, or drift. You can move your lure fast or slow. The key is, try different things until the fish show you what they want. Also be willing to chase different species of fish. Most lakes and rivers are home to several types of fish. There are times when some species of fish are more willing to bite than others. 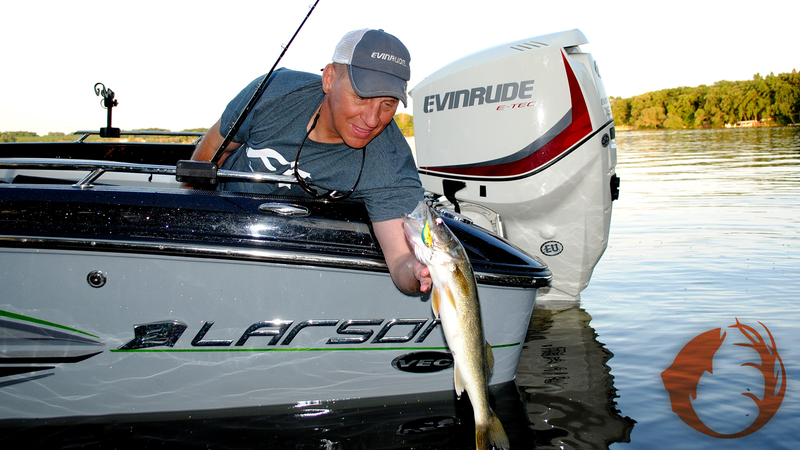 If the walleyes aren’t willing to play along, tie on a bass bait or a panfish bait. It’s important to have a plan in place when you hit the water, but it’s also important to switch to Plan B if Plan A isn’t working. If the type of fish you’re after isn’t cooperating, try catching something else. It’s a lot more fun to catch a bunch of bass than to not catch walleyes. Remember that river fish are often more aggressive when weather conditions are not the best for fishing. On days after a cold front has gone through, when the skies are blue or breezes are light, when lake fish are often hesitant to bite, river fish will be easier to catch. River fish are constantly fighting the current, so they expend more energy. That means they have to eat more often, and that means they will be more willing to take your bait. Mike Frisch caught this freshly spawned out walleye on a day when he only had a couple of hours to be on the water. Those couple of hours paid off with several nice walleyes. Here’s the big one: Go fishing whenever you get the chance. Even when conditions aren’t very good for fishing, if you get the chance, to go, go. And when conditions are good, make the time to go. Time is a precious commodity to many people. We let things like mowing the yard take priority. Every now and then, go fishing even if you have to sacrifice something else. If you go fishing more often, you’re going to catch more fish. Catching fish isn’t the only reason we go fishing, but it sure adds to the experience. If you keep the previous ideas in mind, you’ll add to your fishing experience every time out.